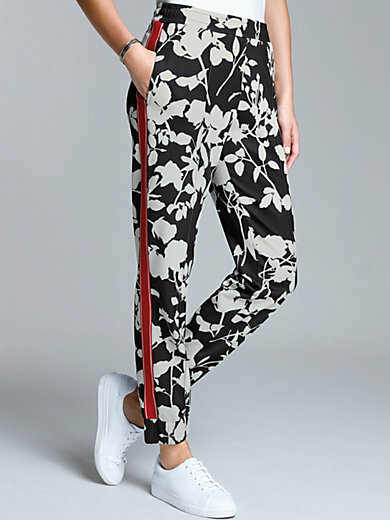 Jogger style trousers by MARGITTES– a fashion statement in athleisure style. Modern scuba fabric with a pretty floral print and red satin stripes in corded ribbon. Drawstring waistband, 2 pockets, and elasticated leg cuffs. 78% polyester, 17% viscose, 5% elastane. Inside leg length approx. 28ins. Ankle width approx. 11ins. The jogger style trousers are machine washable.